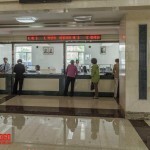 Rason imposed a RMB10 fee for individuals (more for vehicles) to enter the economic and trade zone in December last year. 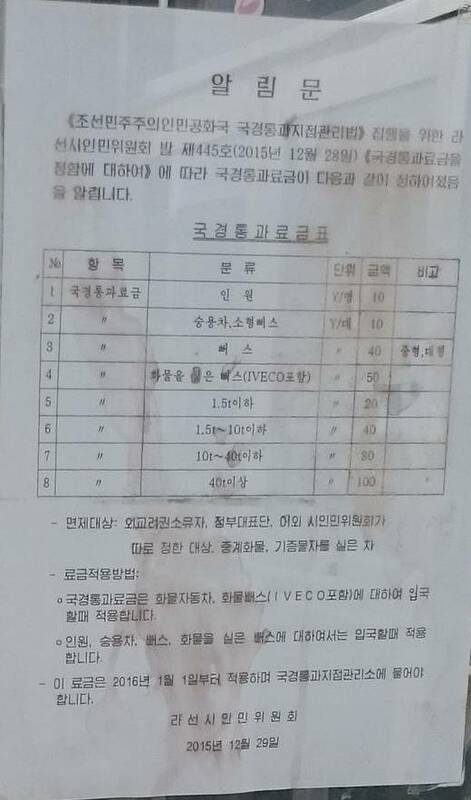 I have translated the notice and posted here as a PDF. Containers carrying bottled water produced near North Korea arrived in South Korea on Monday via a North Korean port as part of a three-way logistics project involving the two Koreas and Russia, government officials said. Ten containers full of bottled water produced at Erdaobaihe in northeastern China arrived at Busan, South Korea’s southeastern port city, earlier in the day after leaving from the North Korean city of Rajin bordering Russia, officials said. The mineral water was produced at a factory run by Nongshim, South Korea’s largest noodle maker, in Erdaobaihe, a town close to Mount Baekdu in North Korea, the highest peak on the Korean Peninsula. 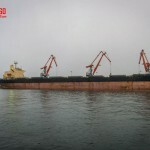 The shipment is part of the two Koreas’ third pilot operation of the project, which calls for shipping some 120,000 tons of Russian coal to three South Korean ports from the North Korean port city of Rajin. The coal, which was transported from Russia’s border city of Khasan on a re-connected railway, arrived in South Korea in late November. The so-called Rajin-Khasan logistics project is a symbol of three-way cooperation and an exception to Seoul’s punitive sanctions against Pyongyang following the North’s deadly sinking of a South Korean warship in 2010. 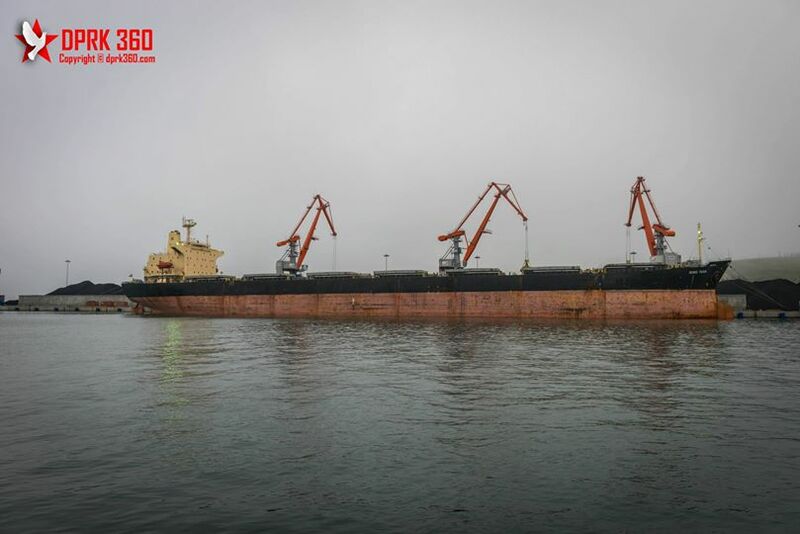 In November 2014, the first shipment carrying 40,500 tons of Russian coal arrived in South Korea without incident in the first test run of the project. 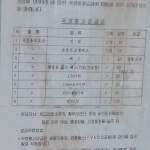 The second test was conducted in April. Aram Pan visited the new Golden Triangle Bank building (it has recently moved offices) in Rason and took some interesting pictures of the interior. That looks like $1.8 million to me. 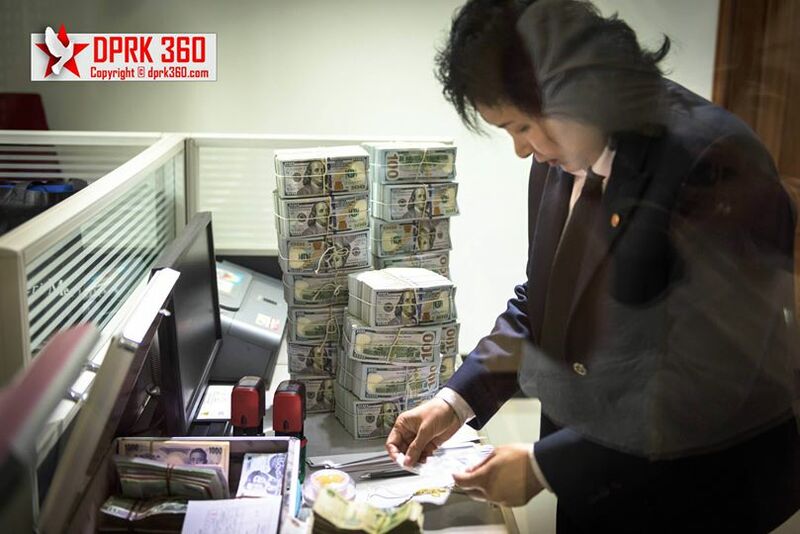 When was the last time you saw that much cash sitting on a counter? 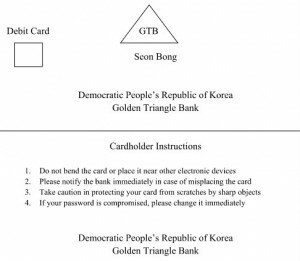 Mr. Pan also shows that the Golden Triangle Bank has established a pre-pay card (similar to the Narae Card or the Koryo Bank Card). I say “pre-pay card” (not debit card) because a debit card is linked to a personal account whereas a pre-pay card is drawn from a bank-owned account. 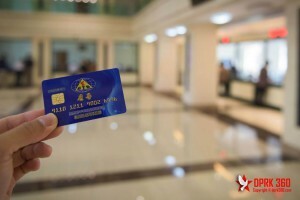 I do not suspect that card holders have actually opened personal accounts at these banks but have instead topped off a card that draws from a bank-owned account (In other words, I don’t think it is easy to get your cash back, and the bank earns the float from investing the currency while the card holder carries a positive balance). Mr. Pan claims to have put RMB25 into his account, which can be spent in the Rason SEZ, but not outside of it. 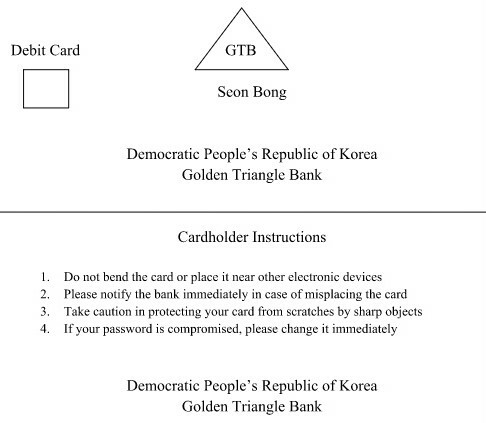 “Seon Bong” is how a South Korean translates “Sonbong”. 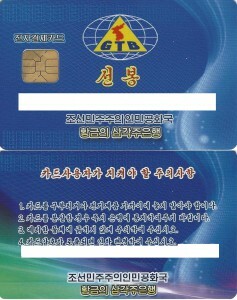 The card appears to be equipped with an EMV chip. I am not sure how that works. UPDATE (2015-8-17): The Daily Mail did a follow up piece here. 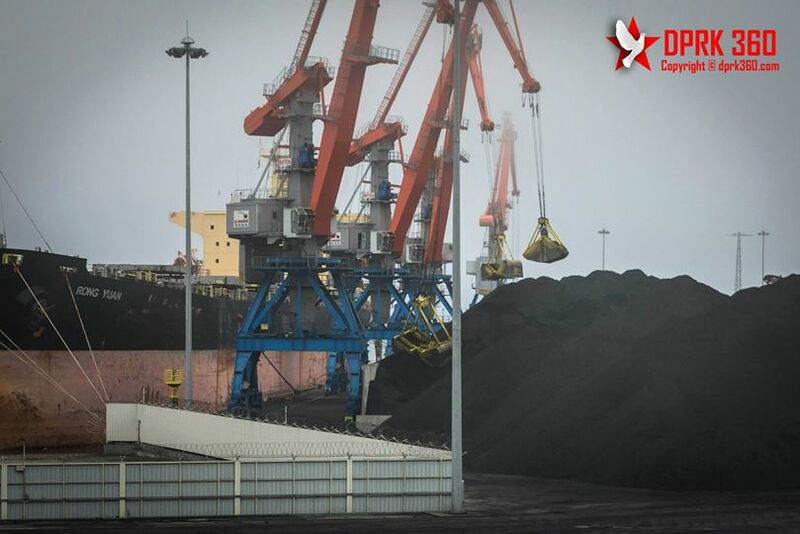 Back in 2011, an experimental project saw the shipment of coal from Hunchun (China) to Shanghia via the North Korean port of Rason. Since then, no such effort is known to have been repeated. A maritime route that includes the North Korean port of Rajin has enabled Chinese shippers to significantly reduce costs over a more time-consuming land route, South Korean news agency Yonhap reported. Chinese cargo from the northeastern city of Hunchun has made the journey to bustling Shanghai twice in June, according to Chinese authorities. Hunchun officials said 38 containers that left the city on June 24 arrived in Shanghai on June 27, and on June 11, 42 containers were delivered to China’s eastern coast – all using Rajin as a key point where cargo could be loaded onto ships. I have not been able to locate any additional information. The name means “triangle” beer, or more accurately “river delta” beer. 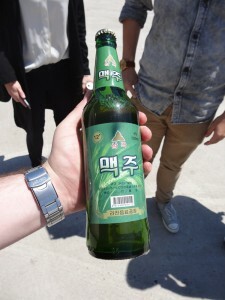 It is manufactured at the Rajin Drink Factory (라진음료공장). I do not know where this factory is located, so please let me know if you happen to learn. 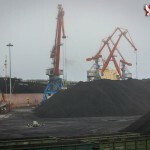 A Mongolian coal miner has signed a deal with a shipping company to deliver its coal via Russia to North Korea’s Rason port, part of the landlocked north Asian nation’s efforts to find new ways to reach overseas markets such as Japan and South Korea. Miner Sharyn Gol signed a binding agreement on Friday with Mongol Sammok Logistics to ship its coal to Rason, where Mongolia already has an agreement with North Korea that gives its exporters preferential treatment at the port. Mongolia currently ships the bulk of its mostly resource-based exports to China, leaving its economy dependent on its powerful southern neighbour and putting it at a disadvantage when it comes to negotiating prices. “This is a pretty historic deal,” said James Passin, who controls Mongolian Stock Exchange-listed Sharyn Gol through the New York-based Firebird Mongolia Fund. “This deal has to be viewed in the context of international relations and diplomacy,” he told Reuters on the sidelines of a signing ceremony. Sharyn Gol currently has no sales agreements in place with any potential overseas buyers, Mr. Passin said, adding that he could not disclose any further details. Mr. Passin declined to reveal any estimated delivery cost for shipments from the Sharyn Gol mine to Rason, but pointed to the preferential treatment at the port and the Russia exports that already go through there to South Korea. 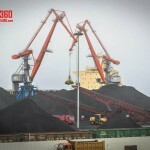 South Korea has at least twice in the past year taken deliveries of Russian coal from Rason, with steelmaker POSCO one of the regular buyers, according to a company spokesman. Namgar Algaa, executive director of the Mongolian Mining Association, said opening up new markets would allow Mongolian miners to manage the risk of slowing Chinese growth. 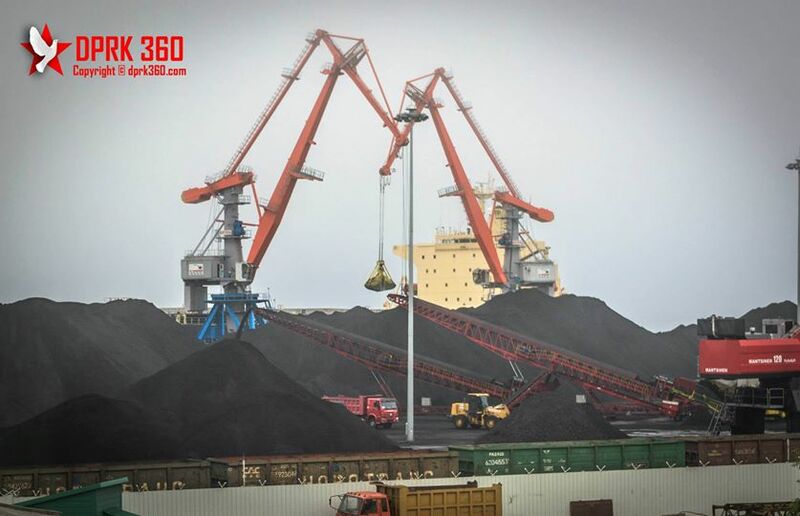 China’s weakening growth this year has meant its coal imports from Mongolia fell 6.9 percent across the first four months of the year to 5.2 million tonnes. 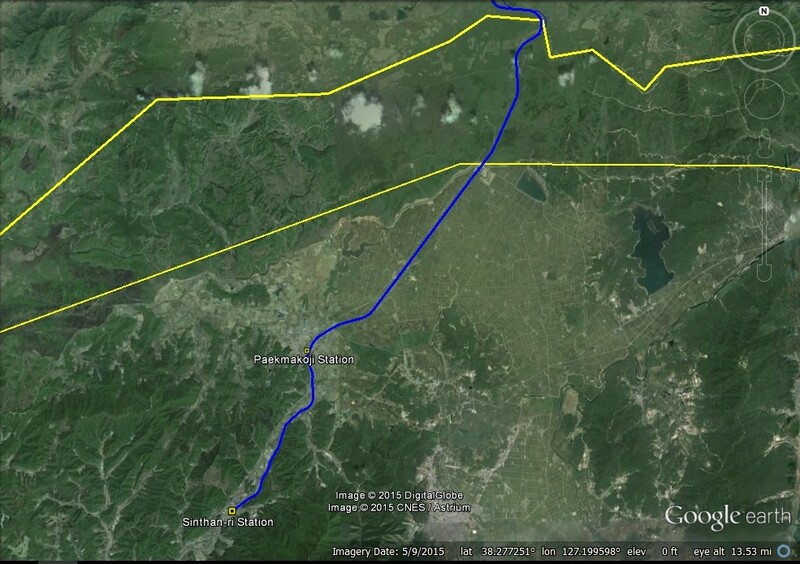 In 2014, foreign-trade cargo transportation through the border crossing Khasan (Russian border)–Tumangan (North Korean border) increased 3.2 times over 2013. At the same time, the transportation of coal increased 24 times. In the first quarter of this year, this trend continued. The volume of transported goods increased several times—up to 432 000 t.
Such data were presented by President of Russian Railways Vladimir Yakunin at the OSJD Railway Summit in Seoul. In 2014, 280 000 t was transported, of which 238 200 t was coal. 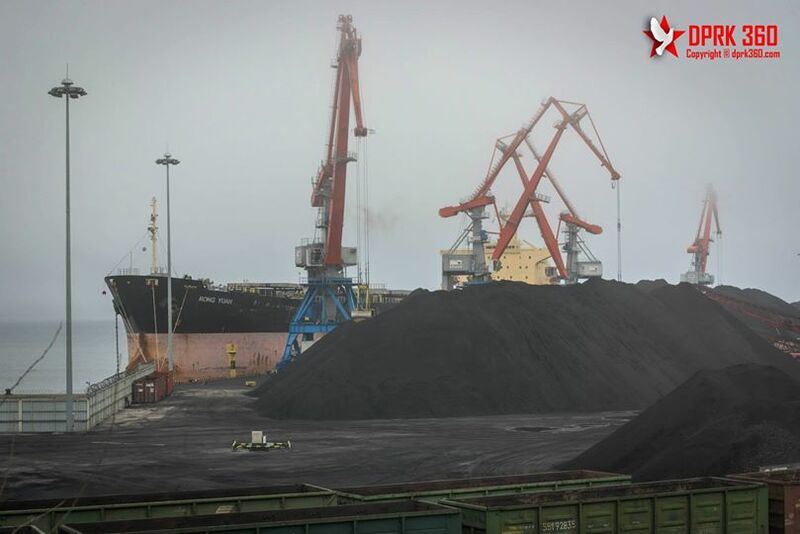 In the first quarter of 2015, 408 000 t of coal was sent to the port of Rajin. In total, according to Mr. Yakunin, it is planned to transport 1.5 million t of coal to the port of Rajin in 2015. Recall that Russian Railways has implemented the reconstruction of the Khasan (Russia)–Rajin (North Korea) railway section and the construction of a cargo terminal in the port of Rajin. The cost of the project amounts to 10.6 billion rubles. “In fact, the restoration of the site is a pilot project in the reconstruction of the Trans-Korean Railway, which in the future will provide communication between North and South Korea,” said Mr. Yakunin. Since November 2014, four experimental coal transportation runs have been carried out through the port of Rajin to South Korea. “The main task today is to ensure the involvement of enough traffic to complete the work of the railway and the terminal and provide a return on investments,” emphasized the head of Russian Railways. The capacity of the Khassan–Rajin site and the terminal is 5 million t of cargo a year. In the future, when a favorable situation is created, the terminal may be employed for the transport of containers. “In cooperation with South Korean companies POSCO, Korail, and Hyundai Merchant Marine, a due diligence investigation was conducted and we are discussing the possibility of creating a joint venture for the operation and development of infrastructure. This project is the first practical step in the development of trilateral cooperation on the development of Trans-Korean Railway. In this venture, we count on the support of South Korean businesses, the government, and the President of the Republic of Korea,” said Vladimir Yakunin. China and Russia are to join forces and morph Russia’s Zarubino Port into one of the biggest ports in northeast Asia, according to the Chinese People’s Daily. 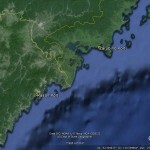 Zarubino Port is at the far south-eastern tip of Russia and a stones throw from North Korea, and only 18km from China. North-east China’s Jilin province and Russia’s Summa Group reportedly signed a joint-agreement concerning the rejuvenation of the port at the fourth Conference on Interaction and Confidence-Building Measures in Asia (CICA), in Shanghai in May, 2014. It is planned that the Zarubino Port will have the ability to handle 60 million tonnes of cargo once construction is completed. ECNS, an English-language Chinese news source, reported a Summa deputy president as stating the planned port will be multifunctional, and is intended to “hugely benefit China and Russia”. The port will be used to serve as a key port in ensuring the security of food provisions. Read more at Voice of America. 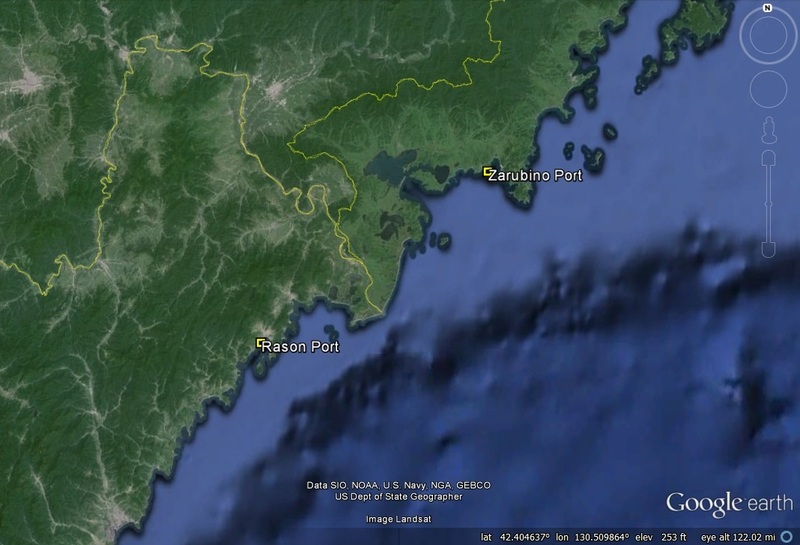 Zarubina port is only 80km (directly) north-east of Rason. It will be interesting to see what kind of effect this project will have on development at Rason. 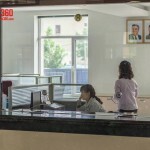 Rason, July 18, 2014 20:13 KST (KCNA) — Wharf No. 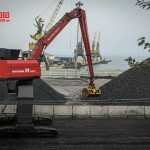 3 of Rajin Port has been built with success in the DPRK. 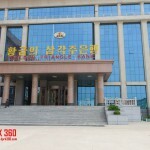 The building of the wharf pursuant to the plan for cooperation between the DPRK and Russia provided another foundation for making a positive contribution to boosting the friendly and cooperative relations between the two countries and economic and trade relations among countries of Europe and Northeast Asia. An inaugural ceremony took place in Rason City Friday. Present there were Jon Kil Su, minister of Railways, officials concerned and working people in the city. Also present there were Vladimir Yakunin, president of the Russian Railways Company, Yury Viktorovich Bochkarev, consul general of the Russian Federation in Chongjin, those concerned of railways and other Russian guests and staff members of foreign embassies in the DPRK. Vladimir Yakunin in a speech said he was pleased with the completion of the wharf. 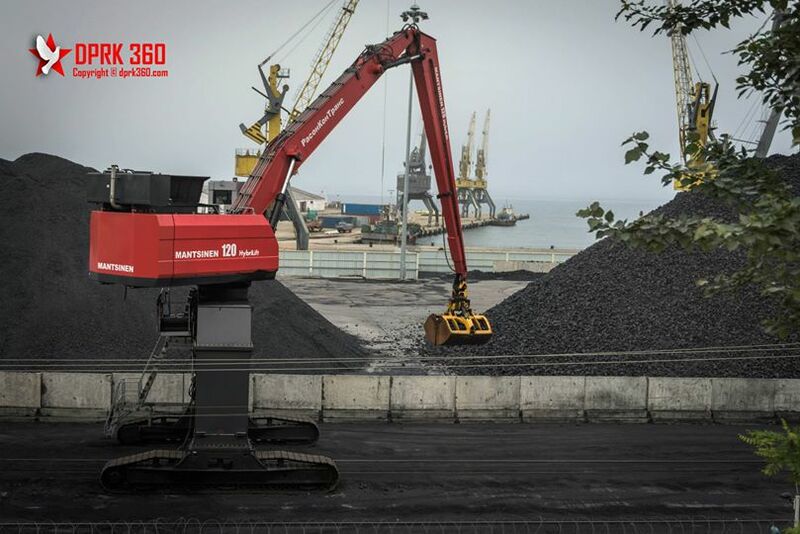 The wharf is capable of loading and unloading millions of tons of coal, he said, expressing belief that such joint work would not only develop the bilateral cooperation but promote friendship and mutual understanding between the two countries. Jon Kil Su said in his speech that the successful reconstruction of the Rajin-Khasan railway section and the completion of Wharf No. 3 of Rajin Port are precious products of the vitality of the Moscow Declaration signed by leader Kim Jong Il and President V. V. Putin. He noted that the transport channel newly provided in the spirit of friendship and cooperation between the two peoples would satisfactorily play the role of a friendship bridge linking Europe and Northeast Asia and, through this, the international position of the Rason Economic and Trade Zone would be further enhanced. A reception was given on the same day. 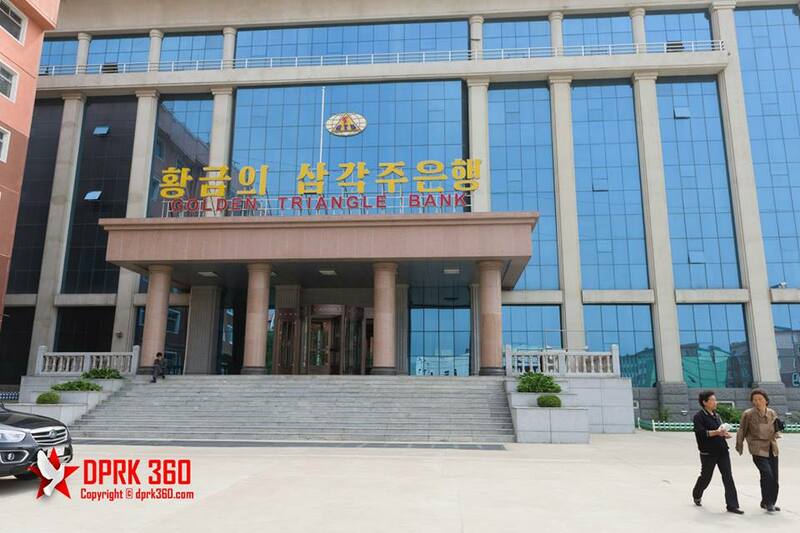 A new Russian-North Korean terminal was commissioned on Friday in Rajin, which is the major seaport of the North Korean Rason trade and economic zone located in the northeast of the republic. Thus, the pilot part of the project aimed at the reconstruction of the Trans-Korean railway from Russia’s Hasan to the seaport of Rajinis over. Relevant agreement of the heads of Russian, North and South Korean railway authorities was signed in Russia’s Siberian city of Irkutsk in 2006. Russian Railways’ (RZD) subsidiary, RZD Trade House, and the Rajin port had established the joint venture Rason Con Trans in order to carry out the modernization process. The cargo traffic capacity of the new high-tech multi-purpose facility is about five million tonnes a year. 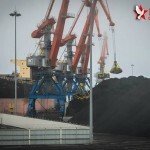 The initial stage of the terminal operation envisions supplies of coal and other bulky goods towards the port. Alongside with cargo transshipment and storage, the terminal makes it possible to organize coal magnetic cleaning and coal separating. Jointly with representatives from Russia and North Korea, businessmen from South Korea were also attending the ceremony. The official ceremony is scheduled for July 18 in Rajin, which is considered the main port of the SRE. Investment in the project is mainly carried out by the Russian side.The volume of transshipment terminal at the first stage is planned at 4-5 million tons, according to ITAR-TASS. Initially, the terminal was planned for container transport, but in agreement with the leadership of North Korea until it will be used for the carriage of the Russian coal. In the future, is expected to increase traffic and expand the range of goods. Agreement to begin the reconstruction of the railway line from the Russian station to Hassan and the port of Rajin as a pilot project to restore the Trans-Korean Railway was reached in 2006. The project started in October 2008, when an agreement was signed between the “Russian Railways” and the Ministry of Railway Transport of the DPRK to cooperate in its implementation. The project is implemented by the joint venture “RasonKonTrans”, created in the same year, with the share of JSC “RZD Trading House” (70%) and the port of Rajin (30%). In October 2011, a team of machinists Far Eastern Railways of Russia led a demonstration container train in Rajin, opening cargo traffic between the two countries. 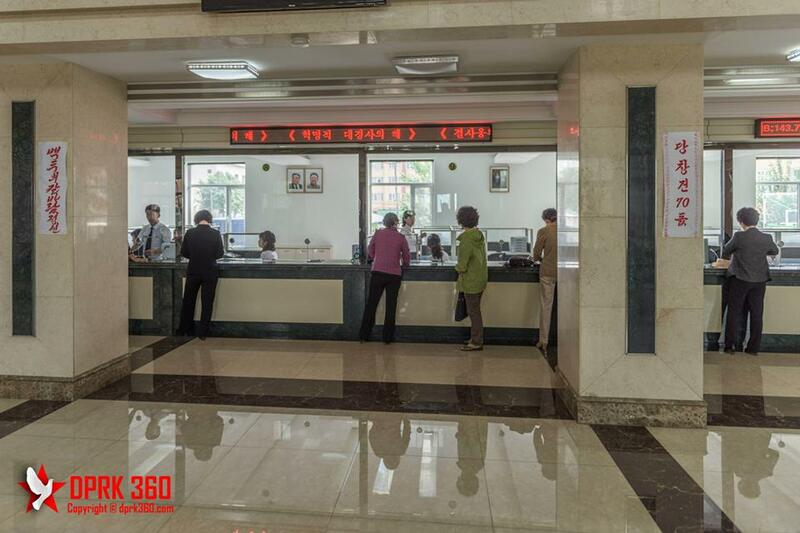 To control the movement of trains on the line Hasan – Rajin, a special control center with the participation of specialists “RasonKonTrans” and North Korean shipping company “Donghae”. 34 specialists from the DPRK have been trained in the training centers of the Far Eastern Railway. 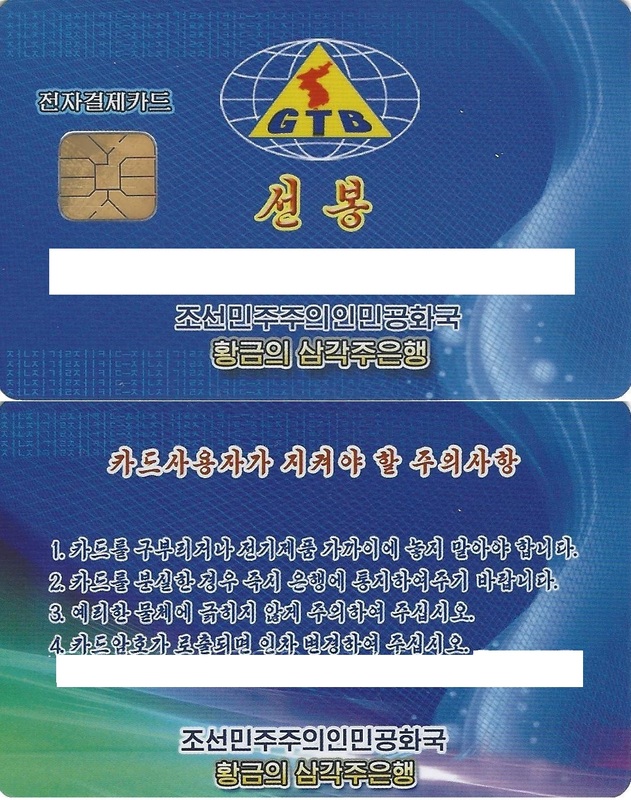 In the future, when the message will be set up all over trnskoreyskoy magitrali – from the South Korean port of Pusan ​​through Korea to Russia, will be able to refocus on the Russian Trans-Siberian significant portion of goods that are currently going by sea from South Korea to Europe. 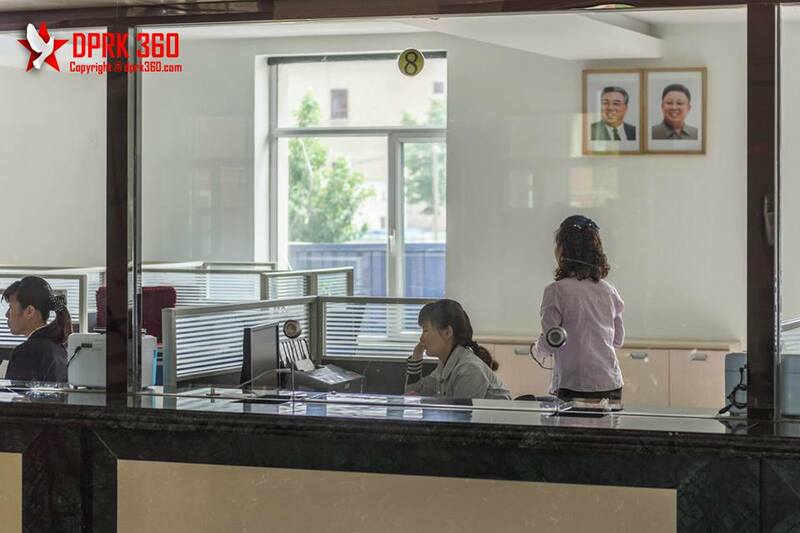 According to experts, these advantages have Rajin – ice-free port on the eastern coast of North Korea with the developed infrastructure, which uses Russian standard gauge with a high degree of security for shippers and benefits for entrepreneurs. 1. The Russia-Rason Railway that services the port was opened in September 2013. 2. South Korea is also interested in the Rajin port. 3. There has been some confusion on the legal status of the various piers at Rajin. I help shed some light on the confusion here. You are currently browsing the archives for the Rason Economic and Trade Zone (Rajin-Sonbong) category.